Apple Logic Pro X official release! Flex Pitch provides integrated pitch editing for audio recordings. This is way beyond AutoTune – Flex Pitch analyzes your audio and then lets do Melodyne-style audio editing. You can move the pitch of individual notes up or down, for pitch correction, or use it as a creative tool. Logic Remote lets you play and control Logic Pro X from an iPad, letting you create and mix music from anywhere in the room. (Screen shots below). Retro Synth is a new virtual instrument that emulates some of the most popular classic synthesizers from the 70s and 80s. Vintage Keyboards offer realistic models of electric pianos, B3 organs and clavs. Track Stacks lets you organize and collapse multiple tracks into one. It can also be used to create complex layered instruments. Smart Controls allow you to manipulate multiple plug-ins and parameters with a single move for quick and powerful sound design. An improved Mixer helps manage mix sessions more efficiently, with increased visibility into signal flow and dynamics and faster ways to manipulate channel inserts. Drummer delivers professionally produced, realistic drum tracks that can perform millions of unique grooves in rock, alternative, songwriter and R&B genres. Drummer is powered by the performances and sounds of some of the industry’s top session players and recording engineers, including mixer/producer Bob Clearmountain. The new Drum Kit Designer plug-in lets you build your own custom kit using a diverse collection of professionally recorded snare drums, toms, hi-hats and cymbals that you can mix, match and fine tune to get the right drum sound for your song. 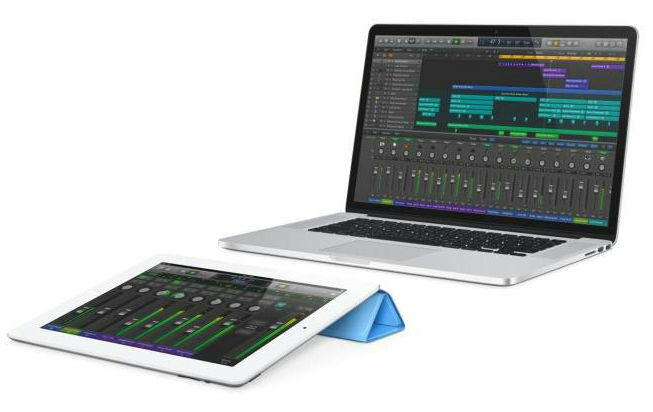 Logic Remote is a new way to extend the creative power of Logic by using your iPad. Designed to take full advantage of the iPad Multi-Touch display, Logic Remote gives users new ways to record, mix and even perform instruments in Logic Pro X from anywhere in the room. The Arpeggiator is one of nine new MIDI plug-ins. It can transform a simple keyboard chord into an elaborate sequence. The new Retro Synth emulates some of the most popular classic synthesizer tones from the 70s and 80s. Vintage Keyboards offer realistic models of electric pianos, B3 organs and clavs, with sophisticated tone-shaping controls. Bass Amp Designer allows bass players to play and record using vintage and modern bass amps, with cabinets and microphones that can be configured to build a custom bass rig. Logic Pro X also features a new Sound Library with an updated loop collection and over 1,500 instruments. It also includes effect Patches that make creative use of Track Stacks, Smart Controls, the Arpeggiator and other new plug-ins. Logic Remote - free download from the App Store. Wonder if there will be any easy way to integrate with FCPX? Logic x reads fcpx X XML. Don't know if its round trip though. I'll post more info when I install my copy tomorrow. Please do! The only hing keeping me from getting FCX has been lack of a good audio editor to go with it. If it round trips, ill be going with FCX/LPX/Davinci Resolve. I am really really curious how logic X will perform!! Been using 9 for a long time now and I'm really wondering if the change in workflow is as dramatic as with FCPX. Will be installing this soon! Would it be possible to have both logic 9 and X on the same mac? @B3Guy So let me get this straight… you don't use FCPX? If you go FCPX make sure you have a crazy fast GPU. Built in scripting allows you to 'roll your own' effect, with an interface. Either you can make your own or download one from someones web site thats into building effects for fun. What you can build it up to you. Auto composition tools comes to mind: algorithmic composition anyone? You will now be able to build any sort of Midi plugin that you can think of… for example: an auto accompaniment patch that plays a bass line to your melody by noticing which chords you are playing… The limit is your imagination. @alcomposer wow, so you could create your own "band-in-a-box" within logic! I don't know anything about Java but I'm sure there will be things on websites or for sale pretty soon that are worth investing in. So essentially logic is now expandable beyond its original package! Totally Band-in-a-box (what is that like 20 years old now? )… one does have to question what took apple so long! What this should allow is complete note & control scripting. This is not however a synthesis language, so don't expect complex sound scripting. (Check out Csound & Cabbage (Cabbage is a project to allow Csound synthesis within a plugin format) for that if you are interested). If you want to learn- it will take about 10 hours to become comfortable with the basics from noob level, check out Code Academy. Its free, and they are FANTASTIC! Its also aimed squarely at beginners, but also builds to more advanced concepts. However if thats not up your ally, don't fear- as I am sure that there will be 100's of code snippets running around the web in the next few weeks! Also Apple states that LPX reads and writes FCPX XML, so its a matter of finishing FCPX audio in LPX, then importing it back into FCPX, more changes etc, repeat until golden brown. Im still downloading, :-( so I will let you know of my experience here. Great times! post some of your findings about LPX here, this seems like a very capable but also accessible piece of software and the link to fcpx is magic! Logic Pro X reads FCPX. The audio of EVERY edit is simply thrown on the timeline. :( But it doesn't crash. LPX is ROCK SOLID. This means either 2 things. Logic Pro X needs a .1 update, or FCPX needs a .1 update. As this is a documented issues around the internet, (not just my project or system) I go with FCPX needing a slight update- as currently there is no- import or export. So look forward to a new FCPX very very soon in an App Store near you. This is an interesting release and the price point is certainly attractive. This could be the version that brings me back to working with the program again. Anyway, most of the features are emulating their competitors, but that was also sorely needed so it's good to see them catching up. The scripting, macro controls and some aspects of track stacks (as well as the price point) all remind me a bit of what Cockos Reaper was doing already, and that's a compliment. In fact, the macro controls look even easier to use than both Cockos Reaper's indirect approach and the combinator in Reason. @almcomposer Keep us posted on your experiences! @thepalalias, the more I work with LPX the more I feel like nothing has changed from LP9. This is nothing like FCP-FCPX. (which I think I was secretly looking forward to more of a Ableton Live sort of program). If you have used logic in the past- there will be nothing new. Just familiarise yourself with where the menus are etc, and new terminology. Apart from the sounds taking over a day to download & FCPX XML not working as advertised (honestly- I think this will be fixed real quick- Apple don't need any more lawsuits) everything is fine. Some aspects of it feel more like Garageband, but thats just cosmetic, there is nothing logic X cannot do that 9 can. My only little complaint is that they have taken away zooming while pulling down or up from the ruler. That was a great feature, as you could navigate anything without touching the keyboard. Now I am going to have to get used to scroll-wheel + option + command. eh. When you navigate to a FCPX project in the media browser from within LPX, a dialogue lets you know that the project has not been prepared for sharing yet. However there is no such setting in FCPX. See image attached. Thanks to Doug Suiter on http://www.fcptalent.com for this clue! Sound for me is a big weakness as I have no musical ability. Do people think you could with a certain amount of time with the software produce decent 'soundscapes' not music but atmospheric backgrounds for that aren't naff? I heard James Longley in Iraq in Fragments used it and I liked the results, just wondering if a tone deaf amateur could do something similar? Do people think you could with a certain amount of time with the software produce decent 'soundscapes' not music but atmospheric backgrounds for that aren't naff? But you can just buy soundcapes. Just search for "cinema soundscapes" or "cinematic soundscapes". @Vitaliy_Kiselev looking at your answer I think i can conclude i misunderstood the question :-) Thanks for helping out! I think James Longley plays around a lot with field recordings as well. @alcomposer I noticed the media browser issue in Logic, too. What I found interesting is that the media browser used to be an option in FCPX before they introduced the new share button/menu. The took out the export to media browser button. The media browser export feature, I believe, originally exported an MP4 to iTunes or a folder set for full exports. Someone please correct me on that. I also had issues bringing in FCPXMLs based on two sequences: one shot on RED and one on Alexa. X2Pro's AAF export/import to Logic worked great, though.